Which Mask Is Your Match? Masking is one of the ultimate forms of relaxation. Whether you #MaskLikeItsFriday, save it for self-care Sunday or start your Monday off with a mask, we can all agree that masking makes us feel centered and refreshed. You might want to try a mask because it gives you that perfect mask selfie, or because all of your friends are raving about it. Facemasks can help a number of skin concerns, but with so many masks on the market, it can be hard to know which one is best for you. Different formulas work best for different skin types, and we’re here to clear up all the confusion – and hopefully your skin as well. Just as you choose your cleanser or moisturizer based on your skin type, your favorite mask should follow the same rules. Masks are a treat, but they still work to serve a purpose. Most hydrating masks can be used daily, for any skin type. But, hydrating masks that also contain anti-aging properties should be saved for about once or twice a week as to save your skin from any extra stress that may come from the mask’s powerful ingredients. While hydrating masks work for all skin types, they’re best for those with very dry skin. Masking with dry skin can be troubling, as the skin tends to be more easily irritated with the drying effects of mud or clay masks. But, if you find the right mask your skin will thank you. Using a mask with a gel consistency will help to lock in moisture and provide your skin a deep, hydrating treatment. We recommend our Collagen Face Mask. The collagen is delivered to your skin with a velvety consistency on a soft cotton sheet. While collagen is known to prevent early skin aging and minimize the appearance of lines and wrinkles, it also brings tons of moisture to plump the skin and leave behind a youthful glow. It’s strong enough to smooth and firm, but not so strong that it will over-infuse your skin. Anti-aging masks are most often also hydrating masks, as they’re the most restorative for moisturizing and refreshing. As the skin starts to age, it loses some of its natural collagen that keeps it plump and dewy. While a mask like the Collagen Face Mask can be used to hydrate and tighten the skin, there are a variety of anti-aging masks that work to add hydration as well as firm the skin. This is important as the skin starts to lose its collagen because it may also have the tendency to experience some sagging. 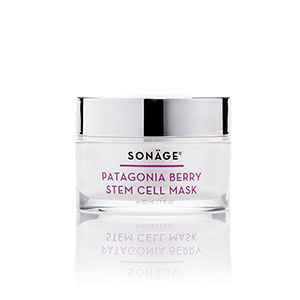 Our favorite mask to hydrate, soften and firm the skin – Patagonia Berry Stem Cell Mask. Its cream-textured stem cell technology leaves the skin visibly brighter while helping to reduce fine lines and wrinkles. Not only does it smell amazing, but its beautiful lavender color makes it one of the most fun to snap a selfie in. 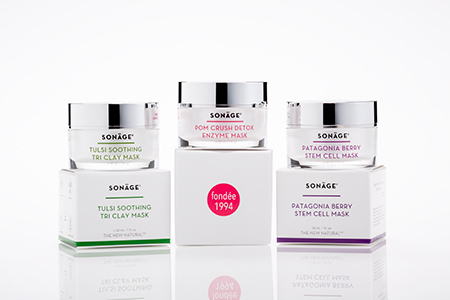 At Sonage, we’re extra excited about clay masks right now. Clay masks work best for oily and acne prone skin because the clay helps to balance out the oils. Clay masks regulate excess sebum and tighten pores, while smoothing and softening the skin’s surface. This works especially well for congested skin, for a deep clean that will extract any impurities. Acne skin tends to be a bit sensitive and can overreact to many products, making it important to avoid ingredients that strip oil from the skin. Clay, rather than strip the oils, works to clarify the skin. Our newest mask, Tulsi Soothing Tri Clay Mask, is perfect for acne-prone skin. Its calming blend of three clays delivers minerals to the skin for a smooth, fresh complexion. Tulsi, Turmeric and Triphala visibly calm redness that may come from irritated acne skin. But, as we mentioned before, if you have dry skin its important to be careful with a mask like Tulsi because of the detoxifying nature of the clay. There are tons of ways to exfoliate, but a mask can give you the deep clean you’re looking for to really get rid of all those dead skin cells. With physical exfoliants, it’s important to be mindful and understand what you’re using and avoid harsh ingredients like microbeads and nut scrubs. Exfoliating masks work best for skin that’s troubled with dark spots or hyperpigmentation. Our favorite exfoliating mask, Pom Crush Detox Enzyme Mask, uses six natural fruit enzymes. Fruit enzymes are becoming more popular for exfoliating because they have anti-inflammatory properties, making them great for sensitive skin. Enzymes work to effectively exfoliate the upper layer of skin mostly made of dead cells and can be a gentler option instead of harsh scrubs and for easily irritated or sensitive skin. Exfoliate the skin three times a week at night to keep the skin in a healthy state and retain its natural moisture. Since they eliminate the top layer of skin, they can brighten hyperpigmentation or an uneven skin tone. Our mask, filled with papaya and pomegranate will have you extra ready for a masking selfie with its bright orange color. If you’re lucky and have normal skin, most masks are yours for the choosing. Just as skin care is never one size fits all, one mask can never heal all. If you find that different areas of your skin are temperamental and require different treatments, it’s a perfect opportunity to try multi-masking. 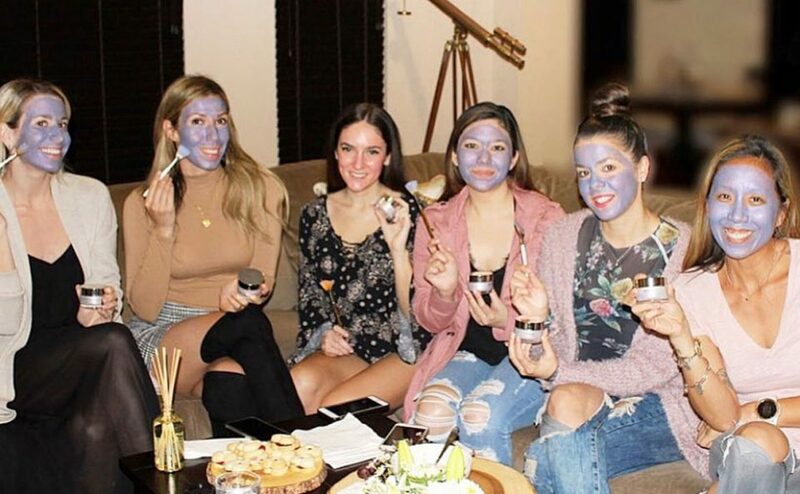 Multi-masking is a technique, similar to what estheticians perform during a customized facial, using different masks on different sections of your skin, to target the concern for that area. Using different treatments at the same time can give you your own customized facial – and it’s always an excuse to up your mask collection. If you have combination skin, multi-masking was made for you. Some of us have very oily T-zones, but then may have dry cheeks. In these instances, a clay mask on your nose and a hydrating mask on your cheeks can give you the all around glow you desire. 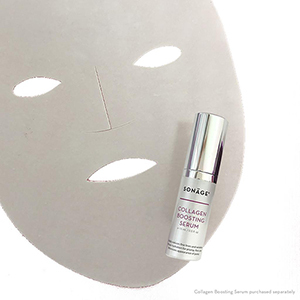 When mask day comes along, evaluate your skin’s needs and choose your mask accordingly. It’s important to choose a mask that’s going to work best for your skin concern. That way masking is not only enjoyable but also delivers consistent, effective results, every time.